LVDT (Linear Variable Differential Transformer) sensor has very stable output signal due to its differential transformer design. The LVDTs are designed for a wide range of industrial and scientific position feedback or measurement applications. Their most advantage is high repeatability once configured. LVDT shows the exact same measurement on restarting after power outage, therefore, no positional information will be lost. Furthermore, apart from the uni-axial linear motion of the magnetic core, any other movements such as the rotation of the core around the axis will not affect its measurements as the moving core does not contact the inside of the stainless steel housing tube and it moves without friction, thus, making the LVDT a highly reliable target contact-type sensor. 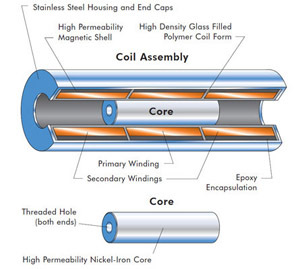 The absence of any sliding or rotating friction allows the coil windings to be sealed against the hostile environments. Linear Variable Differential Transformer (LVDT) is an electromechanical transducer that converts the rectilinear motion of a target to a corresponding electrical signal. In the simplest form of LVDT, the design consists of a primary and two secondary windings with a separate cylindrical core which passes through the contre of the housing tube without any physical contact to the inside surface. The LVDT’s primary winding is energized by an alternating current of constant frequency from an electronic oscillator and the excitation produces alternating magnetic field in the centre of the transducer which induces alternating voltages that are included in the two secondary windings depends on the position of the core. 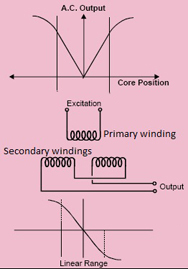 Movement of the core within the magnetic field causes the change of secondary windings outputs and when the core is in the centre of the two secondary windings, the coupling of the primary winding equals to the two secondary windings, therefore, the output “0” is derived. For more details pleases download product brochure. Linear Variable Differential Transformers (LVDTs) are used for position measurement finding applications in energy & power generation, factory automation, aerospace military, subsea marine, industrial OEM, civil engineering and R&D.More application portfolio please click here. Please complete the enquiry form below for specific information and advice on LVDTs.